Here's the machine in her almost-finished state. Never DID get the light-gun holsters set up, but the USB ports we installed for those and other accessories (DDR pads, whatever) are visible below the control panel. 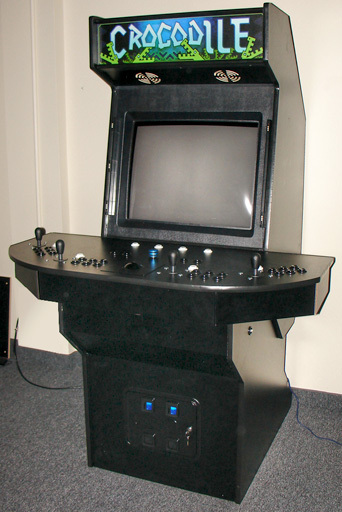 The cabinet body is a stock Ultimate Arcade II body with a custom 4-player Control panel I designed. 4 player stations, six buttons each (and one coin button), trackball and Spinner. Two months after I built this, the company I made it for (Iron Lore Entertainment, rest her soul) went out of business, and I decided not to keep it for myself, since taking on a second arcade cabinet (see also the EmuFarm) isn't something I felt like doing when I was newly unemployed. It ended up going to one of the programmers, who I'm sure treats it well, but still. Sad.